Explanation: Comet McNaught was perhaps the most photogenic comet of modern times -- from Earth. 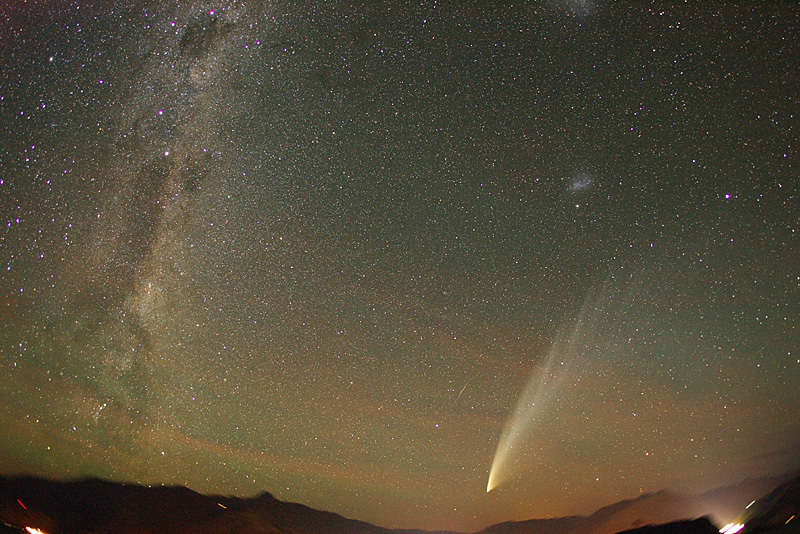 After making quite a show in the northern hemisphere in early January of 2007, the comet moved south and developed a long and unusual dust tail that dazzled southern hemisphere observers. In late January 2007, Comet McNaught was captured between Mount Remarkable and Cecil Peak in this spectacular image taken from Queenstown, South Island, New Zealand. The bright comet dominates the right part of the above image, while the central band of our Milky Way Galaxy dominates the left. Careful inspection of the image will reveal a meteor streak just to the left of the comet. Today, Comet Siding Spring may become the most photogenic comet of modern times -- from Mars. Poll: How do you access APOD?